Eat Your City: Denmark in a day (or 3!) - Nyhavn Canal, Copenhagen - Heering Restaurant and Bistro Part 5! Denmark in a day (or 3!) 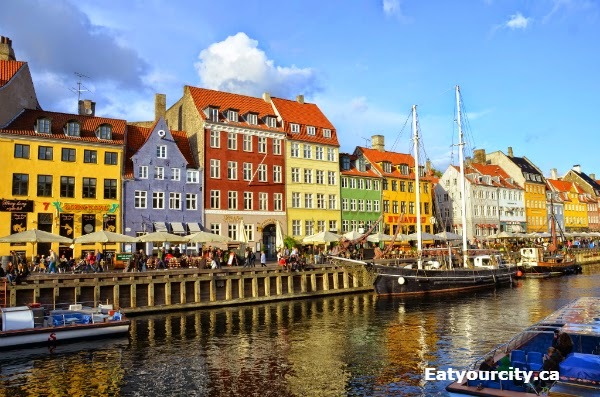 - Nyhavn Canal, Copenhagen - Heering Restaurant and Bistro Part 5! Posted by In our 5 part series that covered the few days we had eating and exploring Copenhagen, Denmark.. we covered in Part 1 - hotdogs, icecream and snacks, Part 2 - Smørrebrøds of Copenhagen - Aamann's and Restaurant Schønnemanns!, Part 3 Torvehallerne KBH Farmer's market, Part 4 Andersen Bakery and now.. some delicious eats on the Nyhavn canal! The canal is a quaint 17th-century waterfront used to be packed with sailors, ladies of pleasure, artists, poets, pubs and alehouses. Now, it boasts tasty restaurants tucked into renovated brightly coloured 17th and 18th century townhouses. The No. 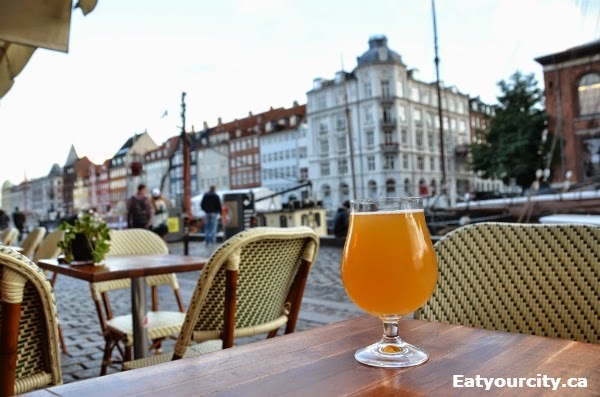 9, Nyhavn, is the oldest house in the area dating back to 1681, while the locals are proud to boast that Hans Christian Andersen (author of many fairytales still told today) lived in No. 20 for twenty years and No. 18 for two years. On to the food! Despite it raining on and off, the locals stayed outside in the covered patios, so we did the same. Its a relaxing atmosphere with a great view of the canals, the occasional tour boat chugging past, and music from buskers that pop up and set up in front of restaurants as the weather permits. We randomly chose a restaurant as we strolled since it was apparent most of the restaurants were not as old as the buildings! Though I loved how the buildings had kept some of the old features as it added to its charm. 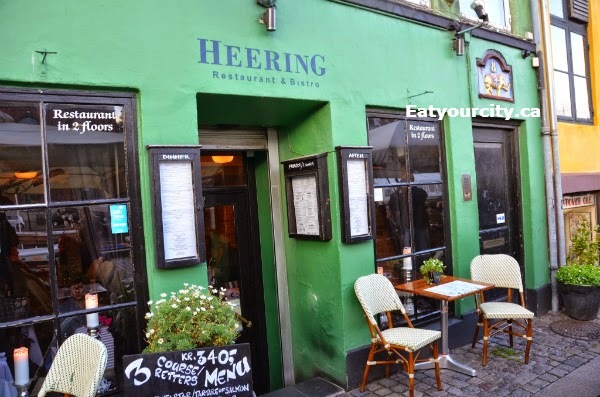 Heering Restaurant and Bistro is located at Nyhavn 15, 1051 København K.
We started off with a beer from Svaneke Bryghus, one of the first microbrewies in Denmark. The Svaneke blonde was hazy, crisp and light with some citrus notes and a nice subtle sweet finish. I had the Copenhagen cocktail (invented by mixologist Gromit Eduardsen and winner of a cocktail contest) which consisted of a shot of Cherry Heering Liqueur (Queen Victoria enjoyed as an after-dinner tipple! ), a few shots of Bols Genever (tastes like a lighter version of gin - original form of gin used in 1800's), simple syrup, lime juice, and Angostura Bitters.. and it packed powerful alcoholic punch. Service was quick, polite and prompt. As we were pretty full from eating nearly non-stop all day, we went with a lighter supper, sipped on our drinks and people watched. We started with a Tartare of Salmon - Lightly soured cream, capers and fresh herbs really let the three types of salmon that made up this tartare shine. It was a wonderful balance of rich, creamy fresh tender salmon, tangy capers, grassy olive oil... the microgreens and lemon weren't needed... and I wanted a mixing bowl worth of this delicious tartare! The Chicken and asparagus tartlette was a must have as it showcased Denmark's super sweet white asparagus along with chicken inside a crispy flaky crust. It tasted heavenly with a creamy yet not too rich white sauce, tender chunks of chicken and the tender sweet white asparagus practically melting into the tartlette sauce. We unfortunately ran out of room for dessert, but enjoyed some live jazz music and admired a rainbow that appeared after the rain.